Tender scalp and hair loss are caused by a variety of reasons, including disease, weather and even hairstyle. Diseases such as hypothyroidism and ringworm can cause these symptoms. It's possible to treat the symptoms with herbal preparations, but you'll need a physician to diagnose and adequately treat those conditions. However, if your scalp is dry and tender due to environmental issues, herbal and home remedies may be all you need to get your hair flexible and your scalp healed. Always seek the advice of a health care provider before taking herbs. They may interfere with the efficacy of medications you're taking. Lavender oil massaged daily into the scalp has shown some promise for treating hair loss, according to MedlinePlus. Subjects suffering from alopecia who used a variety of essential oils--including lavender--had more hair growth than the control group, although more research is needed. 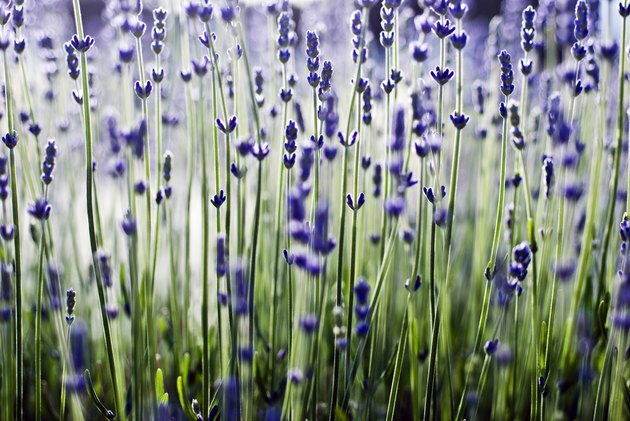 Used topically, lavender may cause a sensitivity to the sun. It's toxic if ingested. Chamomile is known for its soothing properties, which can help treat a sore and itchy scalp. Let the tea steep in boiled water for about 20 minutes and then strain it. Let it cool completely and use it as a rinse after you've shampooed your hair. Add neem oil to your shampoo to get its soothing effect. Neem oil is taken from a species of evergreen. It's a natural antibiotic and calms a sore or itchy scalp. Apply about 15 drops to an application of shampoo and gently massage your scalp. This cleanses the scalp and clears debris from hair follicles, strengthening them. It can be toxic, according to an article at Health-Care-Clinic.org. In fact, it's often used as a natural pesticide. So keep it away from the kids if you're using it. Tea tree oil has many useful properties for soothing the scalp, although no studies exist showing that it regrows hair. It has been shown to be a mild analgesic, so adding 15 drops to a half cup warm water and then massaging that gently into your scalp could relieve some tenderness. Tea tree oil is also an antifungal, says an article in the Journal of the American Podiatriac Medical Association, so if the scalp tenderness is caused by a fungal growth, it will treat that, too.